Will Barclay stands for a picture with the group of guests at the roundtable series. 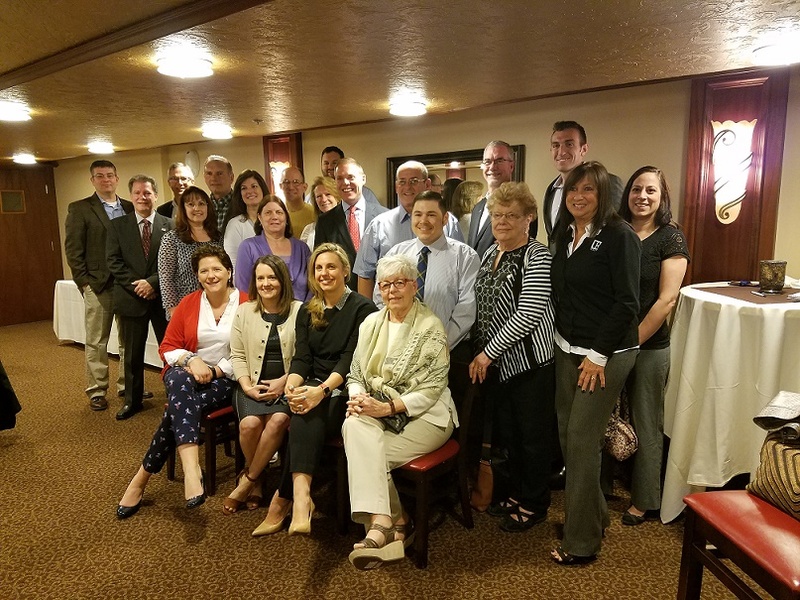 FULTON, NY – Assemblyman Will Barclay (R,C,I – Pulaski) sat with a room full of constituents on Wednesday (April 19) to field any questions and address any concerns as part of the Greater Oswego-Fulton Chamber of Commerce “Meet the Officials” roundtable series. Assemblyman Will Barclay is introduced by the Chamber’s executive director. 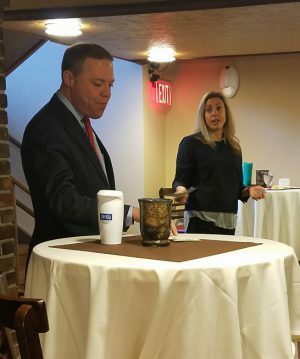 Hosted by Blue Moon Grill, 122 Cayuga St. in Fulton, the Assemblyman addressed a packed room on a variety of topics. To start, he pointed out key issues on the state level that delayed the on-time approval of the NYS budget by nine days of which he said three key issues regarding the budget were not so much fiscal issues at all. Instead, he said the controversial issues were enabling ride-sharing services for Transportation Network Companies such as Uber or Lyft to operate in Upstate, enacting the Excelsior Scholarship Program which offers free college tuition to SUNY or CUNY schools throughout the state for families making $125,000 or less annually, and Raise the Age which raises the age of criminal responsibility from 16 to 18 years old, meaning criminal cases for defendants younger than 18 will be handled in family court. Barclay described the nearly $163 billion budget as status quo, the second most expensive state budget in the country second only to the state of California. 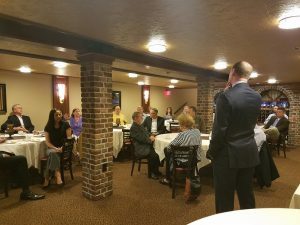 Assemblyman Will Barclay fielded questions from constituents at the Blue Moon Grill in Fulton. Ultimately, while the budget is broken down into seven bills, he voted in opposition to several of the bills. “It really was more of a protest vote for what it’s worth because I just didn’t see anything different in this years budget that’s really going to be transformative for Upstate New York,” he said. Despite Governor Andrew Cuomo’s initial commitment to Upstate, Barclay said he feels as though Cuomo is going back to his base in New York City, strengthening an already strong divide between Upstate and Downstate politics. One of the arguments between politicians Upstate and Downstate included the reliance on nuclear energy. Barclay was focused on the push to ensure Upstate nuclear power plants remained open and was pleased with the outcome in Oswego County, after many forces came together to save the FitzPatrick Nuclear Power Plant from shutting down. However, he said now the attack is focused on the Clean Energy Standard which provides subsidies to keep the plant open. Barclay said he intends to remain vigilant on the matter. Barclay then fielded questions from the audience on topics ranging from animal abuse to economic development, including such topics as zombie property legislation, fuel tax, state tobacco and e-cigarette policies, and creating a qualified workforce in Oswego County. Dialogue among the crowd briefly centered around the development of the city of Fulton after Sixth Ward alderman Larry Macner asked Barclay how the city can bring jobs back after the cost to run a business in NYS drove the once thriving industrial economy out of Fulton. Barclay said the minimum wage increase and paid family leave, while good policies in theory, are all piled together with workers compensation and other expenses to create a cost that is too expensive to do business in NYS. As small businesses have become the backbone to the city, he proposed getting rid of all economic development programs across the board. “If I were able, that’s something I would do but in reality if we are going to do those programs, I want to make sure that Oswego County is well represented for those opportunities,” he said. Executive director of the Fulton Community Development Agency, Joe Fiumara addressed the legislation on zombie and vacant properties to ensure they city can start making progress in this area to keep in theme with the many current revitalization programs aiming to restore the city’s charm. After noting that the attorney general has sole discretion over the funds specific to zombie properties, he expressed his stance that the foreclosure process needs to be cut from the lengthy process that it currently is to avoid these type of situations. He then went on to express his excitement to see the city with a new-found focus on revitalization. He felt adamant that the city can become a great community even more so than it is now. “Fulton, as you know, for the location you are from Syracuse and to the lake, is really ideal. It should be a great bedroom community. It takes some leadership that I think is being provided now and I think there’s a lot of potential here,” he added. Many in attendance left pleased with the responses they had and one lucky audience member won a $25 gift certificate to Blue Moon Grill after all guests who had asked questions were entered into a drawing. The roundtable falls in line with Barclay’s priority to open communication with constituents including town hall meetings and accessible means of communication through his staff. Comment from audience members revolved around the appreciation of Assemblyman Barclay’s honesty. “I think that was great and very informative. He touched briefly on the bills in Albany and fielded all the questions presented with genuine, honest responses,” said Macner. “It was a very open, frank discussion about the issues that face Central New York. He was ready to answer questions in do so in an open and honest fashion. I liked his frankness and openness to deal with any issues in our area, his commitment to put CNY first as a priority in New York State. He’s aware of our issues and he can take them to Albany,” said Fulton resident, Dennis Merlino. “I appreciated his honesty on tobacco policies in the state and the usage of e-cigarette products. He identified that it is a problem and even knew himself that tobacco usage is high in Oswego County and therefore a large contributor to health issues. To hear how he really was knowledgeable on the issue and understands it’s importance meant a lot to me,” said Joe Wicks, Community Engagement Coordinator for the Tobacco Free Network of CNY. Assemblyman Barclay is open to questions or comments or anyone that would like to be added to his mailing list or receive his newsletter by contacting his office by mail at 200 N. Second St. Fulton, NY 13069, by e-mail at [email protected] or by calling (315) 598-5185. Looks like the Greater Chamber of Commerce has gone political. Selecting only Barclay supporters to attend a meeting. So sad it use to be a bipartisan organization. Why didn’t they just call it a Republican round table meeting. Don’t try and claim Macner isn’t a Republican, anyone that knows him knows where his loyalty lies. 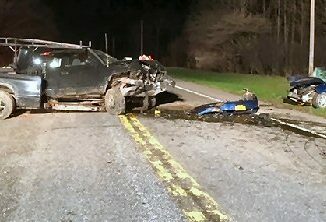 Just what has Will done for Oswego County ? My invite must have gotten lost in the mail. Would have loved to attend and asked some pointed questions.I was there for lunch this week. Oh well another Republican gathering I wasn’t invited too. I don’t see how anyone can be “happy with the initiatives that are taking place” in Fulton. The city seems to be dying. What is the future for the “City with a Future” ? More BS, more handouts and no jobs.